Just the sound of them picks you up and takes you on vacation... and the Toucans will get you there first class! 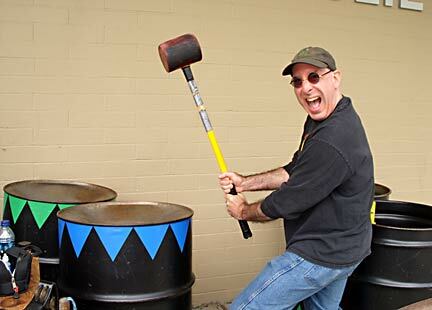 Come along & enjoy the bright sunny sound of Seattle's Favorite Steel Drum Band. Our Tropical Northwest beat is guaranteed to get your body moving and your spirit soaring! We've played thousands of Toucan Shows for hundreds of thousands of Toucan Fans, and recorded plenty of great Toucans Music, too. The Toucans are a great choice for public & corporate events, private parties, weddings, BBQ's, school shows, or any other event that needs some fun & lively music! During the Spring & Summer, you can often find The Toucans performing live all around the Pacific Northwest. And if you're searching for great steel drum music, take a look at our brand new album, or download a barrel-load of our songs from the iTunes Music Store! Spring is here in the Tropical Northwest! Take a listen to our latest album 'Toucans Play Reggae' or find more great Toucans music by clicking on any of our many albums to your right, or on the iTunes or Bandcamp buttons to your left. The Toucans are a great choice for school events, too! Assemblies, Parents' Night, Neighborhood Concerts, etc. - drop us a line and bring the bright sunny sound of the Toucans to your next event! Meet the Toucans Steel Drum Band! Learn about the Toucans Instruments! Listen to lively Toucans Music! Look at the newest Toucan Photos! Discover facts about the actual Toucan Bird! Please feel free to contact our band using the info at the top of the page, and remember to keep your ears open for the Toucans! Thanks For Visiting The Toucans Online!